On Tuesday, December 1st, charities, families, businesses, community centers, and students around the world will come together for one common purpose: to celebrate generosity and to give. 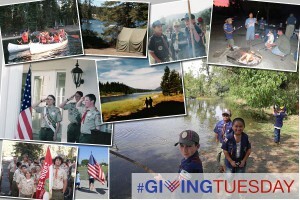 This #GivingTuesday we ask that you give the gift of Scouting. With its family based programs, Scouting helps parents make the most of the little time they have with their kids. It creates opportunities for youth to gain memorable experiences and become instilled with values, principles, and skills that will help them develop into the future leaders of our nation. Scouting prepares young people for life. Share this link with friends, family, and coworkers. Check with your employer to see if they will match your gift. Follow us on social media and share our posts. Every bit counts and helps us serve more youth with a quality program. We thank you for your contribution. #GivingTuesday is a global day of giving fueled by the power of social media. #GivingTuesday kicks off the charitable season, when many focus on their year-end giving.